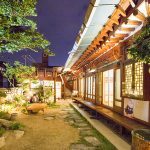 Apart from Jeonju Hanok Village, where should you go to take instagrammable photos in Jeonju? 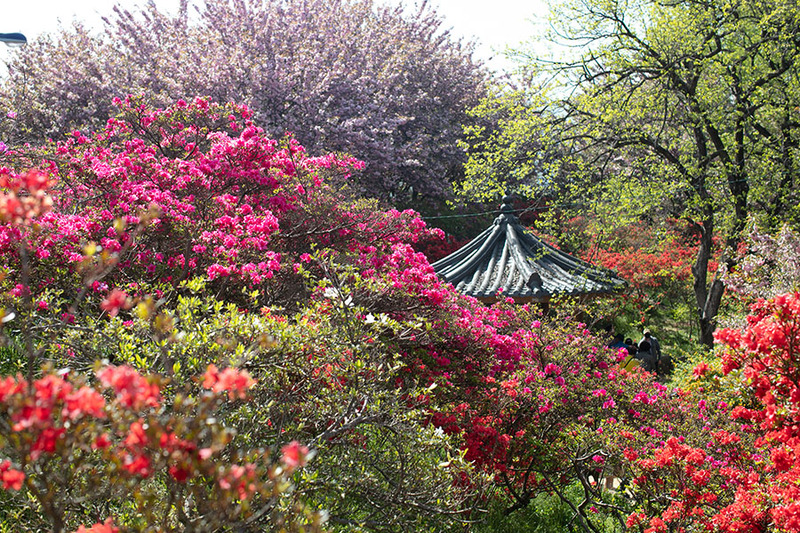 Wansan Park is the place to visit in springtime. 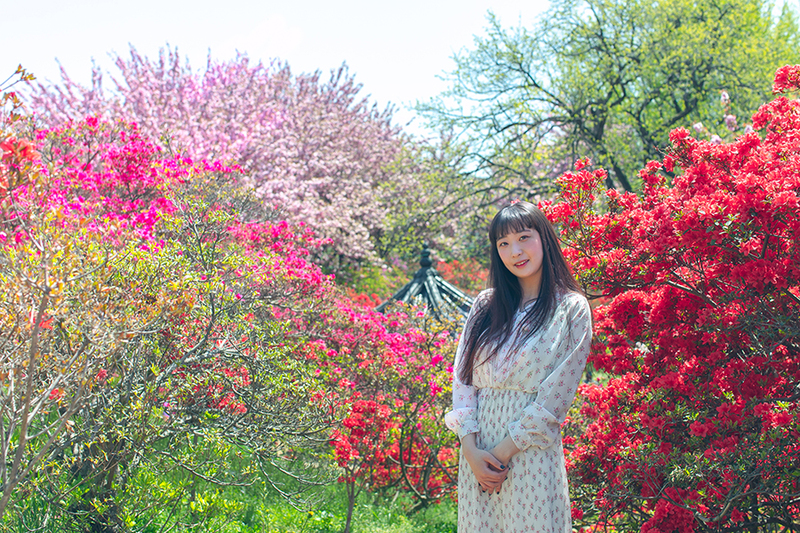 In April, the park is literally covered with flowers including cherry blossoms and royal azaleas. 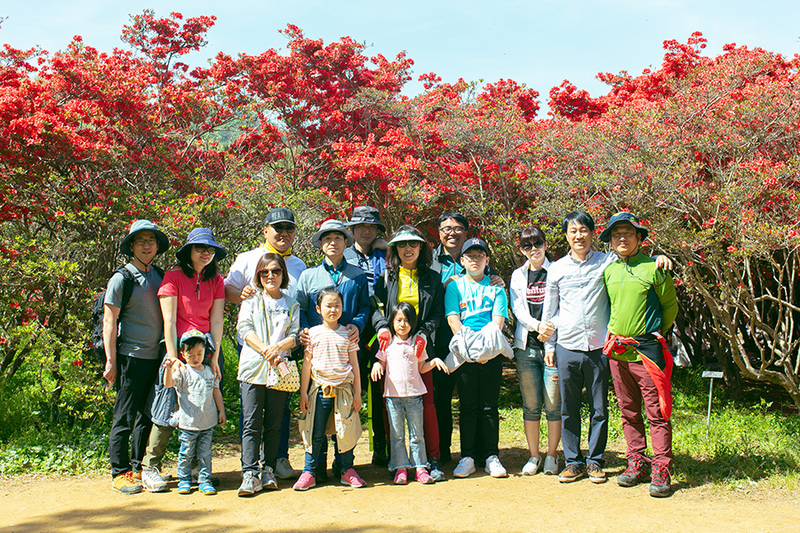 The flowering trees in Wansan Park have been planted and taken care of by the locals. Thanks to such efforts, the park has become the source of pride for the locals. You have to visit here during April, when the spring flowers are in full bloom. 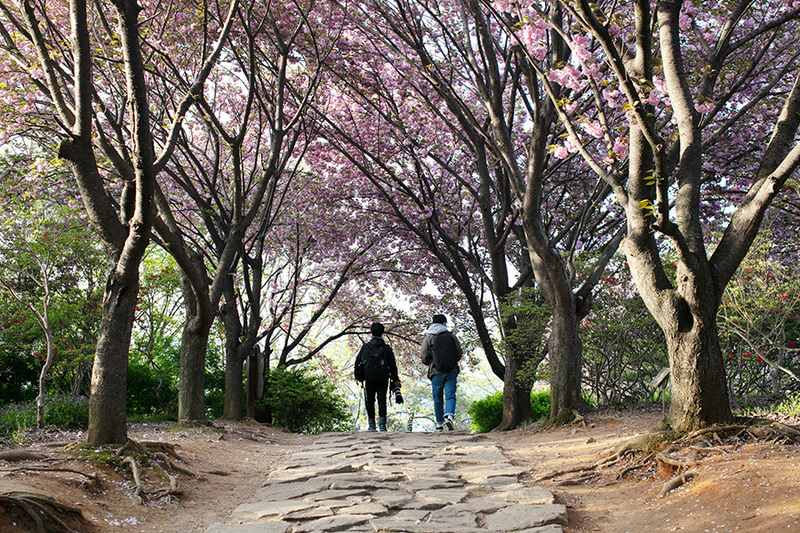 Wansan Park is particularly famous for the glamorous double-flowered cherry blossoms. You’ll hear the camera shutters everywhere. Today, I’ll introduce you to the most photogenic spots in the park. 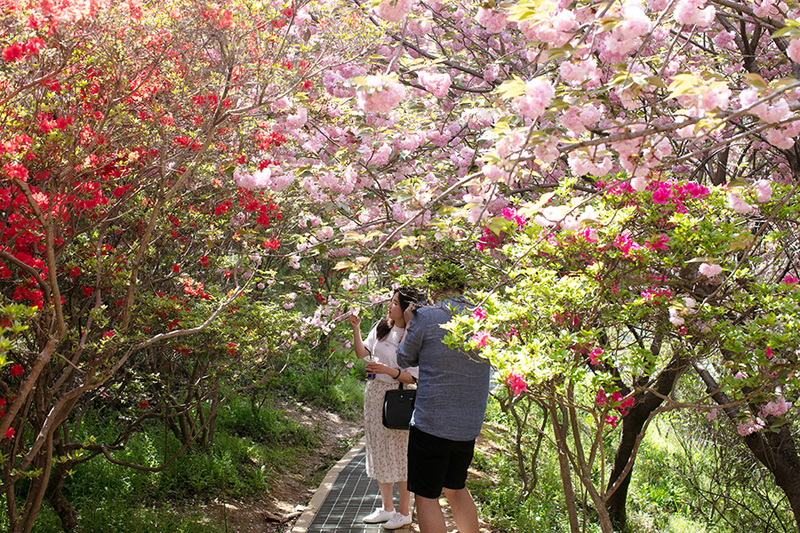 If you enter the park through the trail behind the Wansan Library, you’ll find a royal azalea tree and two beautiful double-flowered cherry blossom trees. The photo will give elegant green-ish and pink-ish sensations. 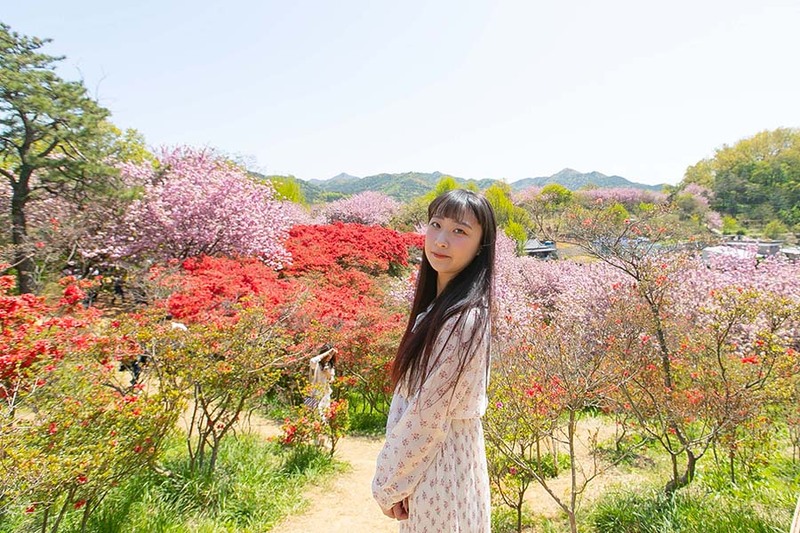 *tip: The person in the photo better be between the two cherry blossom trees. Also, use landscape mode! You can make a unique and memorable photo by including the pavilion and red royal azalea flowers in your frame. *tip: It’s better if the person in the frame is well in the front and also on the right side of the pavilion. 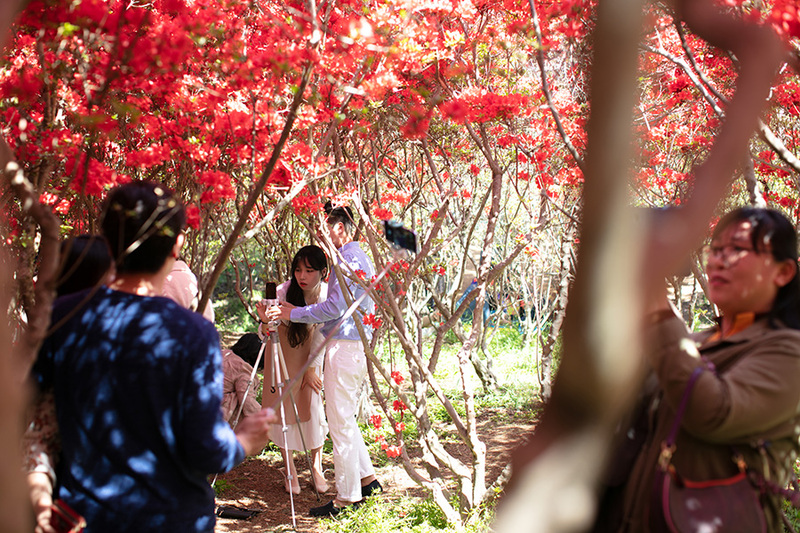 Walk into the ‘tunnel’ of royal azalea flowers. You’ll find an amazing photo spot. *tip: When using a mobile phone, the focus is better when shooting the upper half of the body rather than the whole body. The double-flowered cherry blossoms are also making the tunnel. *tip: The trail is a bit sloped. 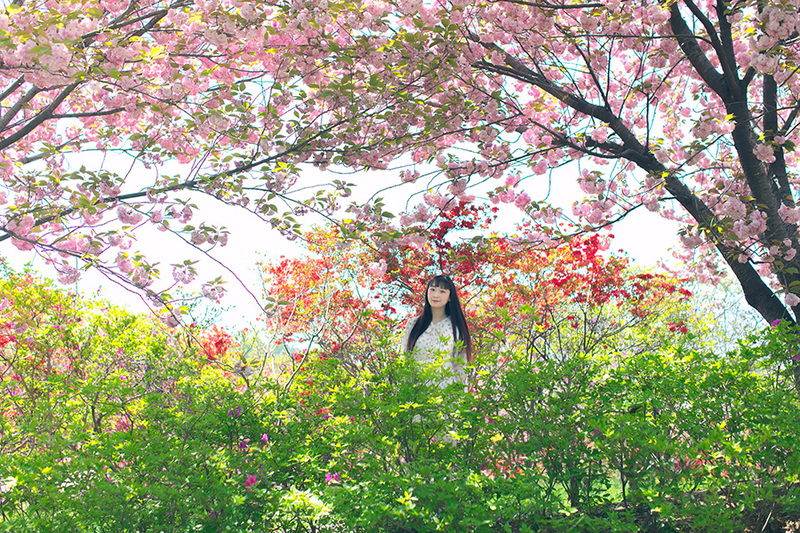 Take a torso shot, and you’ll also have the cherry blossom tunnel in the frame. On the top of the park, you can put the widest perspective of the park in one frame. The downhill trail from the top of the park is another royal azalea tunnel. You cannot pass this trail without taking a photo amongst red royal azaleas and pink double-flowering cherry blossoms. *tip: The trail is quite narrow. Hence, it’s better to situate the person in either left or right side of the frame, rather than the center. 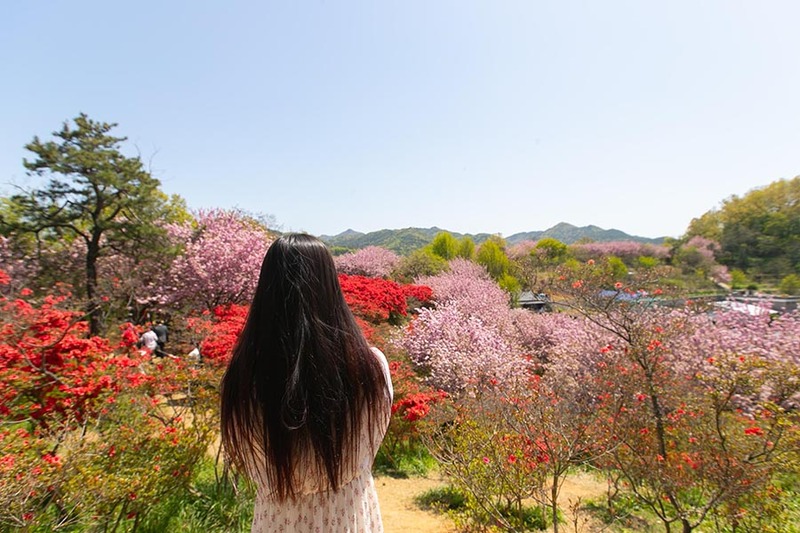 In the flower-blooming Wansan Park of April, with any camera and either with or without a tripod or selfie stick, you’ll be creating the most memorable photo. 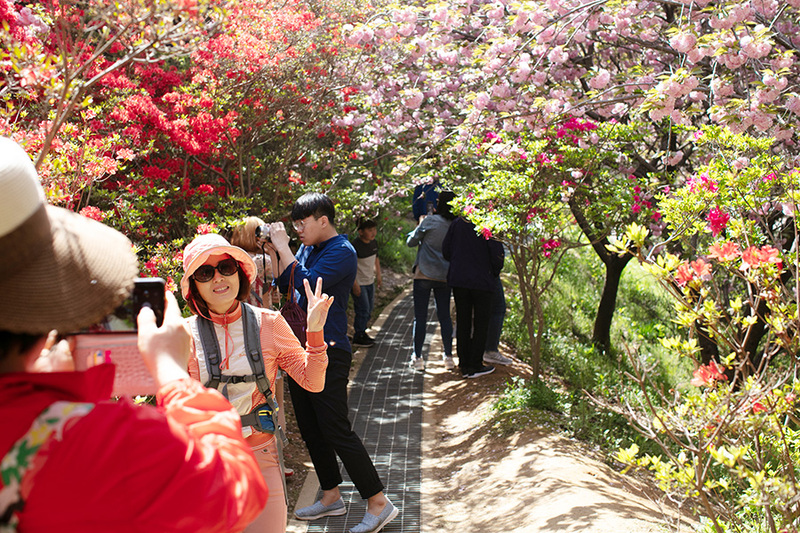 Take your DSLR, polaroid, or just a mobile phone to the Wansan Park while this year’s flowers last! Wow! I have never seen so many different colors in one place <3 it looks so breathtaking! I want to go there for my Instagram!! 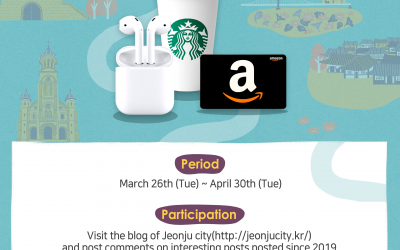 Didn’t know that there is such a place in Jeonju!!! Amazing view! I wanna go there again! One of the Best things about Korea is that everywhere you go there is gonna be a good place to take good pictures and have a nice time with your friends. This place looks amazing! I went there last year, but by that time all the flowers had already bloomed. I wish I could go there again when everything is in full bloom! Is this place open in all four seasons? 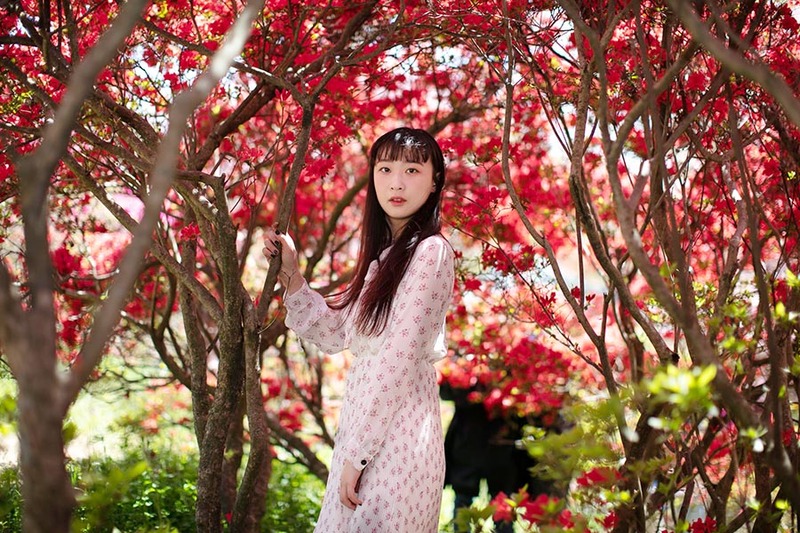 Cherry blossoms are cute but those red royal azaleas, holy smokes!!! That is one of the most beautiful flowers I’ve ever seen – that color is so vivid. 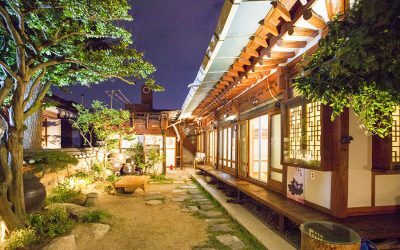 As someone who really enjoys horticulture, Jeonju is such an exciting place and I really can’t wait until I’m here. Wow, the flowers and trees look very vibrant. But I imaging this park to be a tourist hot-spot with many visitors every day. The views look amazing though! The red royale azalea flowers is so glamourous! Photo taken there must be very pretty!!! So beautiful!! I wish I could visit there soon!! its so worth going there! 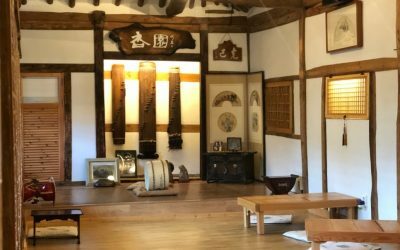 OMG, I lived in Jeonju for almost 2 years and I didn’t knew about this place! Next time I visit for sure I will stop there! this is one of the best places for flowers! ohh is it also this beautiful in fall? The royal azalea tunnel looks amazing. I definitely will visit soon. where do you upload them? Wansan Park! Awesome place that highly recommended during Spring!! It is good that there is a open spaces for family outing especially Summer season is very good to have picnic on the weekend!! I believed that people who loves natural park would definitely fall in love to this place! I feel like everyone really goes out of their way to see the cherry blossoms. Even before I moved to Korea that is mostly what I saw my Korean friends posting but the azaleas pop so much more. I’m excited to see them coming out and they smell amazing too! The variety of flowers available at Jeonju Wansan Park really makes me want to go. 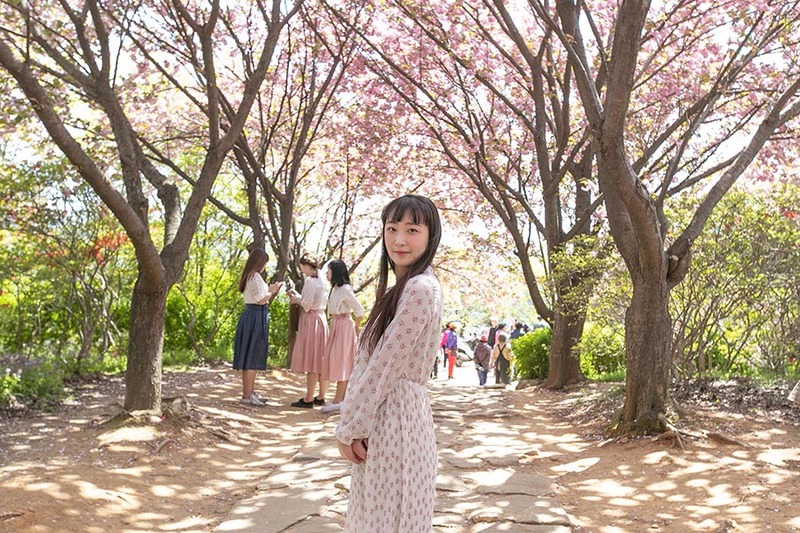 But I had the opportunity to visit the Cherry Blossom Walkway at Ansan Mountain in Seoul instead, and being surrounded by so many flowering trees was honestly so beautiful. 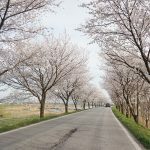 Although the season is coming to an end for the cherry blossoms, it is still incredibly worthwhile to visit these parks/mountains for other flowering plants and scenery. Get ready your camera and Instagram !!! Is the red royal azalea open in other seasons or only spring?? If jeonju was a woman i would marry her!!! yesss!!!! took some pictures of my gf here! Everyone should try going during golden hour!! There are so many flowers and colors, it looks like a wonderful painting!! Why am I only finding out about these places now? T T. Would’ve been nice to visit before the cherry blossoms have withered. 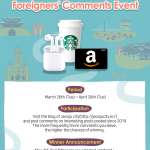 Flower-Blooming JeonJu Wansan Park is one of the must visit places if you are an active user of social media platforms. During a certain period of the year you will have a chance to witness amazing beauty of nature. I personally really enjoyed double-flowered cherry blossom trees, the seem to have such a good harmony together. 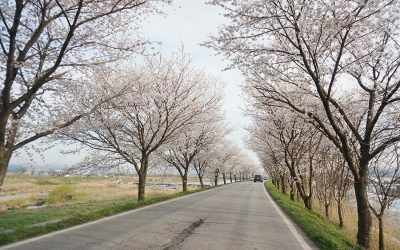 And of course taking photos in cherry blossom tunnel would be amazing. During the blooming season this place reveals great aspect of colors and flowers. Great tunnels and places for some wonderful spring-inspired photos. It’s too bad that the photos for this article weren’t taken during morning hours when the crowds were to a minimum and the light – less harsh. Oh omg i wanna take photos at there !! I’m surprised that I havent heard about this place before- it’s stunning! 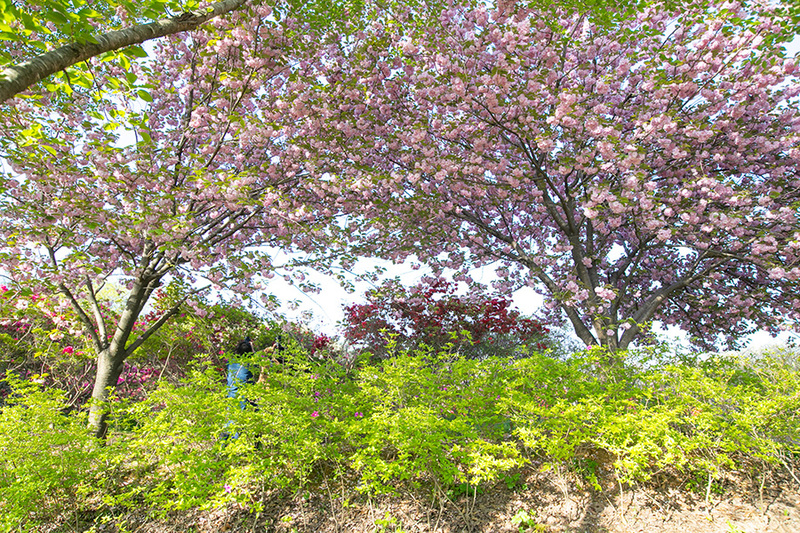 Spring and Jeonju………….beautiful and colorful.